Here at UHA Race 4 the Environment, we take pride in knowing our children, pets and family are living in a safe and healthy environment. As part of this movement we are in, we have recently tested beaches along the coast of Dana Point, California all the way up past San Clemente, California towards Oceanside. What we found is shocking and must be dealt with but we cannot do it alone! We need your support to make our beaches and environment a safe place for families and communities to gather together without the health risks that are lingering in our waters and beaches! We have updated the report and are exposing the results to the public in hope that we can join together to stop this wide spread of hazardous chemicals and pollutants. Removed 30,000 tons of contaminated soil from the Former Norton Air Force Base in San Bernardino, California. The site was previously used as a landfill and was being future zoned for residential housing. 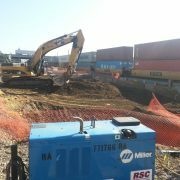 Removal, and disposed of one, 1,000 gallon underground storage tank discovered at Whittier College. The tank once used for heating oil was discovered during onsite construction for the campus student center. Post removal samples were collected and analyzed for possible soil contamination. 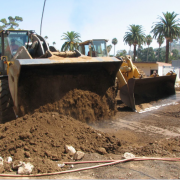 Provided soil removal activities for the Las Virgenes Unified School District at the construction site for a future elementary school. Services include the excavation, transportation, and disposal of 1,500 cubic yards of pesticide and lead impacted soil. The site had been previously used as a agricultural area. 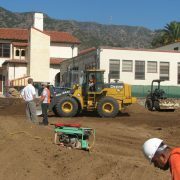 Multi-phase contaminated soil removal for the Long Beach Unified School District at an elementary/middle/high school located on Catalina Island. Services include the excavation, of 3,530 tons of arsenic and lead impacted soil. 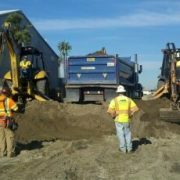 Soil was loaded onto trucks and transported to a barge at the docks, then transported from the island to the Port of Long Beach, and loaded back onto trucks for transportation and ultimate disposal at an approved Class 1 facility. Activities also included relocating/re-installing portable classrooms, and site restoration. The site had been previously used as a landfill prior to the school being established at the location.